... imagine a kind of internet video jukebox that contains only one (five month long) video... but instead of playing that video end-to-end each time a selection is made, the jukebox plays only 60 sec. clips randomly constructed -- in real time -- from just a few of its 12,000 accessible bits and pieces. Cool? Maybe not. For even though this jukebox always plays an engagingly different, curiously non-sensical video each time; every video regardless of preference selection absurdly and uncontrollably communicates a similar TV message: informational, sensorial, temporal, contextual and authorial chaos - as inculcation. This is the “nature” of contemporary U.S. TV news production and presentation. 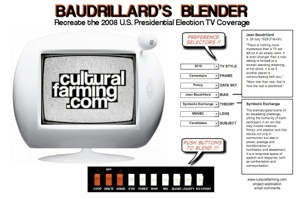 Baudrillard's Blender is a simple ethnographically performative response to how I “experienced” the 2008 U.S. presidential election media coverage on television (as participant-observer-ethnographer)... and how I intend to “play” my experience back into our media-ether in a form of gift-reversal (potlatch). Baudrillard's Blender is a reciprocating no-frills, low-brow, self-writing-montage-machine for thinking critically about a combination of cultural leitmotifs: television, political process, journalism, communication, and media citizenship. It is a methodological performance of Symbolic Exchange as ethnographic surrealism. It is media appropriation as critical documentary. To over-simplify my media research (Cultural Farming, 2004), I ethnographically re-mix (montage) existing video content (bricolage) to illustrate contemporary media production practices... but also, to purposefully challenge, test and extend critical media theories (disambiguation). Importantly, this broadens well beyond quotidian notions of comedic video mash-up or parody. Indeed, I am evolving my work toward Jean Baudrillard's most important, yet arguably his least investigated notion: Symbolic Exchange. Symbolic Exchange is directly derived from cultural potlatch rituals common amongst many primitive societies, including North American indigenous peoples of the Pacific Northwest Coast. These rituals were ceremonial periods of feasting and were importantly accompanied by lavish ‘giving away’ -- often including the public destruction of private goods and property. Those who most honored ceremonial attendees by giving away or publicly destroying the most personal property also honored most the names of ancestors/descendants and earned the greatest social prestige. Anthropologists have described these cyclical ceremonies as a form of “divestments” of private property invoking deeply important elements of economic distribution, social bonding and political processes; all central to the maintenance of a society. Symbolic Exchange, therefore, is based upon the liberating and sometimes ostentatious and confrontational divestment of property - never its accumulation. It privileges an immediate, actualized, collective mode of relations via transformative experience and communication through the act of giving back. The need for these socio-cultural potlatch rituals are typically felt and released during periods of ‘carnival’. Today, by comparison, these destructive yet liberating occasions are never exchanged between contemporary media industries and their viewership. In return, citizens have shown little interest in offering an obstructing, reversible, one-upmanship response or media “overthrow” so necessary to our own regenerative cultural enrichment (Bouleversement 2007). Indeed, it is doubtful that today's social media explosion (YouTube?, MySpace?) could ever become exemplars of this necessary form of Symbolic Exchange overthrow since any potentials within these corporatized venues are instantaneously subsumed, marginalized, and regulated, in lockstep through a variety of means, such as big-media ownership, anti-net-neutrality, pay-to-play, copyright legislation, etc. 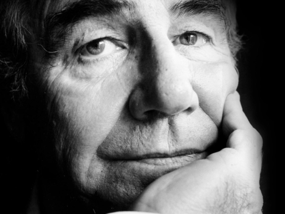 For media theorist Jean Baudrillard, there is no liberation or revolution of the media available at all save "restoring the possibility of response". That is to say, allowing media-speech to "be able to exchange, give back and repay itself"; although paradoxically Baurdillard admits this would require "an upheaval in the entire existing structure of media". Well, if Baudrillard is correct, how can "overthrow" be attempted? What does “overthrow” look like? Baudrillard never gets around to telling us the answer. But one suggestion within Baudrillard's notion of Symbolic Exchange is to literally turn media "against itself"; to "challenge all fixed, unilateral power relations, to unsettle their single-pole; to reinstitute a cycle of relational speech and response". In short, to begin making TV against itself. This way, Symbolic Exchange can be seen as a necessary, responsive, reciprocal (yes sometimes even dangerous) counter-gift to the insidious advance of media content/simulacrum. Symbolic Exchange thus is never simple parodic comedy; rather it is a higher-order of "destructive, annihilating truth" -- a type of potlatch 'ritual' made purposefully against media's excess of reality and diabolical conformity. Most forms of media communication today are struggling mightily to become a kind of television. Out of this, and coupled with today's voracious and unbridled capitalism; we find ourselves living in a historical moment when hegemonic fluctuations may be rebalancing media to favor citizens. Indeed, within a globalized lust to satisfy newly contrived consumer demands, a deluge of potentially emancipating media technologies recently swept the consumer landscape: Broadband, iMovie, Blogger, YouTube, cell phones, Quicktime, to name only a few. Paradoxically, these simple technologies can be purposefully re-employed to monitor, challenge, and interrogate our increasingly mediated world. We can and should utilize these technologies, not only in art or research, but also as an opportunity for recuperating civic discourse -- and importantly to help inform and reform any media that inhibits full democratic response and participation. In 2004, I walked away from a 20-year design career in television. I went back to school in 2006 and forced myself to watch TV news again with newly critical eyes, looking beyond my expertise in visual communication to examine how it is interwoven with aspects of production, text, performance and ideology. Doing so, I began to re-edit and re-mix TV/media content at home for the first time. It was oddly epiphanic. TV suddenly Media became ‘plastic’, malleable, slower. I began to watch and listen differently. I understood more and I began to ask questions: Was I the only one truly watching this corporatized spectacle of unending deviance -- in this case bad TV which I helped create? Does anyone look at how news information is manufactured now; or listen to how it is being disseminated; or consider how it is publicly ingested. Is no one else resolved to openly and critically challenge its intensifying language and technique -- as it devolves from the dramatic to the parodic to the tragic? An ethnographic pathway was opening. Could I construct a responsive methodology toward TV news production and dissemination that connected the critical theories of the Frankfurt School of Adorno, Marcuse, and its orbiting intellectuals: Walter Benjamin, Siegfried Kracauer, and Bertolt Brecht; to the culturally situated Birmingham School of Raymond Williams and Stuart Hall, to the visually pragmatic Chicago School of John Dewey and Howard Becker; to the technological biases of the Toronto School of Harold Innis and Marshall McLuhan; while perfuming it all with the diaphanous Parisian media philosophies of Baudrillard, Barthes, Bourdieu, and Debord? What about the political economies of Noam Chomsky and Bob McChesney? ...Or the truly avant-guard like Breton, Duchamp, Man Ray, Magritte? What of the early Russians like Mikhail Bakhtin, Dziga Vertov and Sergei Eisenstein? Would it be possible for me to weave these stunning critical similarities with all I had seen and experienced during my TV news production career? Could I reflexively talk back to media by appropriating and repurposing its language and technique? And, could I do it all following James Clifford, George Marcus and Norman Denzin within the untapped potentials of ethnographic surrealism? I decided to try. 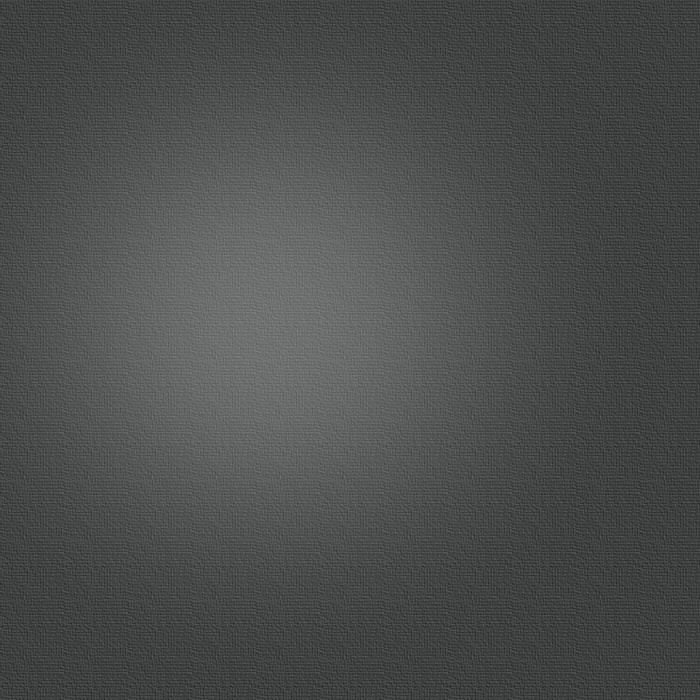 One of my many experiments is this Blender project. And so, my research is intended to not only critically provoke contemporary TV production, screen presentation, and media consumption -- but to also provoke viewers, along with my ex-clients and cohort in TV news and journalism, even the intellectual community itself. Indeed, mine is a dangerous and experimental ethnography using the previously written as a backdrop for dangerous and experimental commentary. Mine is, to use George Marcus' phrase, a "messy" video project; one that is intertextual, open ended, resistant to theoretical holism, yet always committed to invigorating cultural criticism. Mine is a responsible, reflexive, feminist, communitarian project that announces its politics as it ceaselessly explores the realities of corporate media - and all while folding my own perspectival story into the mix to produce meaningful, performative, critical discourse about the crazy media-worlds we all inhabit. Baudrillard's Blender is, functionally, a media-randomizer-jukebox-website. Its purpose and scope are to proffer Symbolic Exchange with the 2008 U.S. presidential election TV coverage. Blender contents consist of approximately 12,000 individual clips (22 total video hours) randomly accessible for replay in innumerable 60 sec. combinations. 12,000 video clips were individually culled (by hand and by me alone) from well over one hundred hours of archived TV coverage broadcast throughout the early primary campaigns, candidate debates, party conventions, post-convention campaigns, presidential candidate debates, and election and post-election periods: 2006-2008. This new project (launched: 25 Jan 09) is conceived entirely as a “low-brow”, simple to use, free and open access internet website. Its actualization is to honor the monumental work of French media theorist Jean Baudrillard (died: 6 March 2007), and importantly to attempt recuperation of his most controversial media premise: Symbolic Exchange -- while simultaneously situating numerous theoretical markers referencing my own video scholarship. 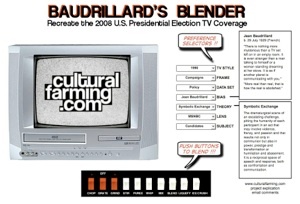 Baudrillard's Blender is a video "randomizer". To engage the web-project: Select one item from each of the seven drop-down preference selectors to suggest narrowing content aggregation (Theory and Bias selections are accompanied by term definitions- as literature review). Then, once all seven preferences are selected, visitors click on one of ten "blender speeds". A small embedded application randomly selects numerous video fillips (totaling approximately 60sec. in length from thousands of pre-ripped selections), and then linearly assembles and replays the groupings as an instantaneous and unique Election '08 mash-up. 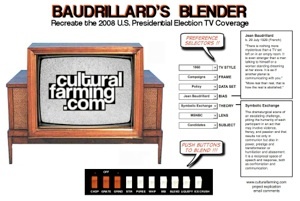 The "point" of Baudrillard's Blender and this brand of surreal media ethnography is to provoke deeper critical media understanding by turning the familiar 'idea' of contemporary TV election coverage into a kind of violent strangeness, and, again turning that strangeness back into its familiar violence. Honoring Jean Baudrillard, all this, of course, will be made still more ‘symbolic’ since 3 of 7 Blender preference buttons are functionally irrelevant regardless of selection (four functional buttons: Style, Frame, Bias, Theroy). And, all ten Blender speed buttons function simply as one. Indeed, Baudrillard's Blender is not about indexical empiricism or verisimilitude cleverly remixed. Rather, Baudrillard's Blender is a parodic invitation --a violent seduction-- to meaning-making through the absurd expectancy of theoretical filters; while performatively crushing and re-authoring news (and theoretical) authority into “gifts” of carnavalesque response: Dis-con-struction as ill-communication. Maybe we can learn something important along the way.